CURC will continue to fight for fair pensions for all Canadians, more than 100 delegates to the 10th Constitutional Convention unanimously decided. work with other like-minded organizations and individuals to inform Canadians of our Retirement Security campaigns. 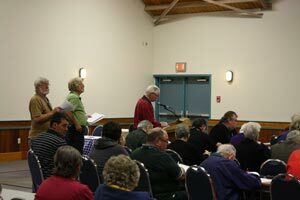 Delegates line up at the mic to support CURC’s continuing pension campaign. Support was strong from every corner of the convention hall when the resolution came up for debate. The Tories’ plan for a privately run so-called “pool pension plan” has “serious, serious problems,” said Don Wright of the Toronto Area Council. Speaking of the bashing of public-sector retirees because of their guaranteed pensions, Suzanne Clancy of the Ontario Federation of Union Retirees said people need to realize that pensions are deferred wages.